TM Mangal sells high quality BBQ charcoal wholesale and retail market. Our products are made of hardwood and fruit trees. Wood burning in modern pyrolysis stoves, only the raw materials produced by the combustion temperature of 500 - 600 degrees Celsius. The resulting product - the charcoal of the highest quality that meets TU 24.1-32692239-001:2006 (similar to GOST 7657-84 grade A). As a fuel, charcoal, are used relatively recently in Ukraine. But the level of sales today is very high, as a practical, easy-to-use fuel was a great native to wood. Charcoal burns for a long time, high temperature is reached in just a 15-20 minutes, with no harmful combustion products. In addition, search and log-wood is not always possible, and time for their harvest and the burning of leaves is not enough. Ukraine used charcoal for a long time, for example, in industrial processes (metallurgy), this is especially important with the increase in coke prices on the world market. The absence of phosphorus and sulfur in the charcoal makes it a reducing agent, indispensable in certain processes, for example, in the production of ductile iron. In medicine, charcoal produce activated carbon - a great absorbent needed with food poisoning. In agriculture, crushed charcoal added to the diet of some animals and birds, and when planting bulbs, roots and charcoal dust is added to the soil. Caloric content of charcoal is high - 8000-8350 kcal / kg or 33,52-35 MJ / kg. the final temperature of burning depends on the carbon content of charcoal. At very high temperatures (1600 C) - Carbon content - 99.7% of organic matter. The ash content in coal 2.5-3.5%, in its composition is dominated by CaO, K2O, Na2O, and that is characterized by very low phosphorus and sulfur. The calorific value of charcoal 7000 - 8000 kcal / kg. For all of these goals requires a high quality wood charcoal in bulk. 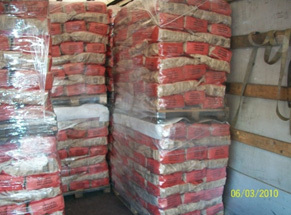 TM Mangal are sells charcoal in bulk to Ukraine, Europe and other countries. Our product is perfect as a raw material in various fields. All products are accompanied by a full package of required documents. We supply both small amounts (small wholesale), and large quantities. For household use charcoal packed in big bags or in bulk. Industrial supplies of charcoal are discussed individually.